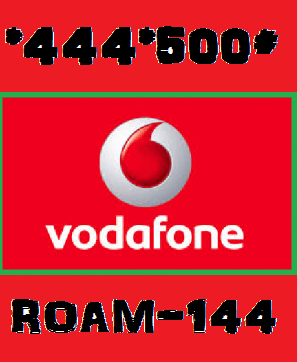 Vodafone free roaming plans Activation for 1 day and monthly. Vodafone is one of the second largest Telecom company all over the world and operates in over 30 countries. After TRAI reduced the roaming tariff limitation, many operators took their step forward to give roaming free plans for their subscribers. Vodafone too introduced one day free roaming at Rs 5 for 1 day and also a monthly STV roaming free offers. Here is the details for activation. You would receive a confirmation message about the activation of the service. This code is valid for all state of India. Note, this offer is valid for only one day, and would cost you 5 Rs from your main balance. You may check other USSD code of Vodafone here. Also you can download My Vodafone App to see all plans live. You can enjoy two more packs offered by Vodafone for free, for monthly and for 7 days. You need to recharge as STV(Special tariff voucher) which might cost you around 70 to 77 Rs and 35 to 45 Rs respectively, depending on your circle or region. But wait, i am still in confused, why Vodafone introduced 7 days pack, as it cost more than what we can recharge for daily 5 Rs pack. Note that, only incoming calls and message would be free, while you are charged for outgoing calls and SMS according to call rates while roaming. Hope this post helped you to discover the best offer you need to opt for, in Vodafone. Comment below if you have an issues and other experience, to activate the roaming free plan. I turned on the roaming and still nothing why complicate everythin?